Bournemouth 7s Festival is rapidly approaching and Team Entries and Tickets to the 7th edition of this event are selling out in record time. There are now only 10 Rugby Spaces remaining across Men’s and Women’s Social Cups. Over 160 Rugby 7s teams are already confirmed to take part in the festival that is forecast to completely sell out by the end of March. The Rugby competitions on show range from the ‘Viper 10 National Cup’, which will welcome some of Europe’s best touring 7s teams with players from across the globe competing for the title, to social cups which are typically made up of club touring teams, university alumni groups & friends who form barbarian style teams. 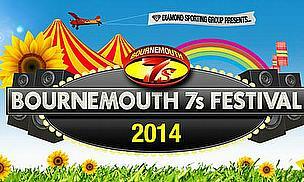 In addition to the Rugby 7s Cups, Bournemouth 7s Festival is also expecting to welcome over 100 Netball teams, 64 Dodgeball teams and 36 Hockey teams to the 2014 Festival. Attracting over 20,000 people Bournemouth 7’s is also renowned for it’s exciting line up of live bands and resident DJs, which combine to create a unique experience fuelled by brilliant fancy dress, innovative themed arenas and an unrivalled festival atmosphere.